I’d mentioned in an earlier post that I had an uncle who was 8 years older than I was. He was so much fun! Because he was a late-in-life baby for my grandparents, they had the time and money to indulge him. Surprisingly he wasn’t spoiled and he loved to play with us at the family gatherings. With his help, we had the best fun because he had the best toys and the best ideas. His toys were just cool, as were the cabinets full of old comic books. We got this tractor after he died. My parents lived on acreage, so we got a lot of use out of it. It wasn’t as much fun though without him there. That wasn’t the only gift we got after he died. We got one last Christmas present – he’d bought them earlier in the year. My grandmother found them when she cleaned out his room. Those cardboard dolls and their frilly clothes were a wonderful last memory from a wonderful uncle. 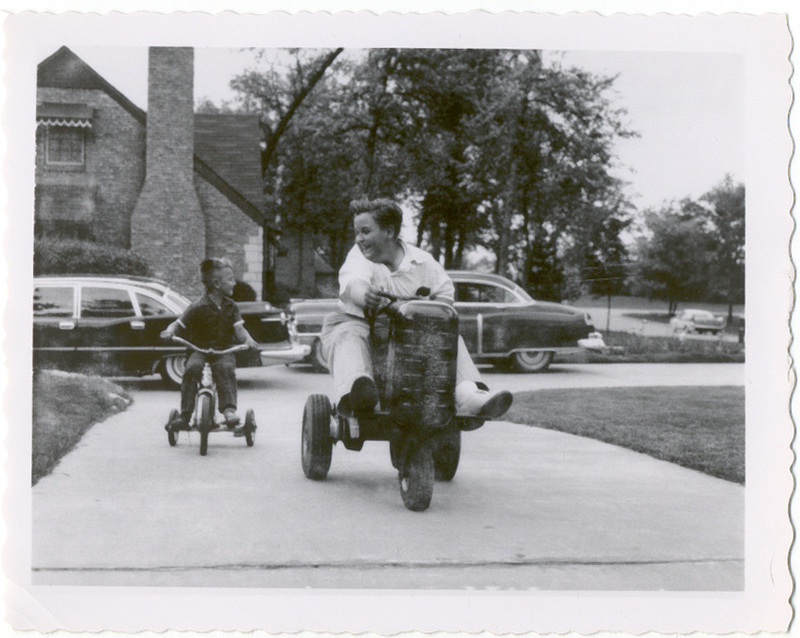 The other little boy (on the tricycle) is a cousin (also older than me). I hear from him several times a year and each time, with great affection. It was great growing up with my uncle and all those cousins. Word for tomorrow – BALANCE. If you prefer to work ahead, see the list for the week under “A Word A Day”. Previous Week of Vacation – So Much Fun!